From my research, Bet365 is one of the biggest and most recognizable sports betting brands in the world. With this size and reputation comes trust and strong business practices. They are also able to offer odds on sports or events that other smaller books simply do not have the resources or player base to provide odds for. Bet365 does not accept players who reside in the United States, but they are one of our top recommended bookies for players from Canada, Europe and around the world. 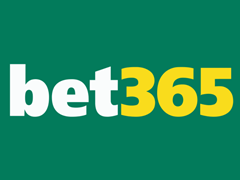 Click here to check out the Bet365.com website for yourself! ***Due to advertising restrictions imposed by Bet365 I’m unable to elaborate on their bonus offering. Click the above link to learn more at their official site. You must be 18+ to join Bet365 and terms and conditions apply to this bonus. Bet365 is a massive sportsbook. If it’s a professional sport or high profile event the chances Bet365 is taking bets. Search through the left sidebar in all the possible categories to attempt to find the sport you are looking to bet on. If that fails contact customer support to figure out for sure if bets are being taken. Once again Bet365 is a massive worldwide gambling company. This comes with one of the biggest poker rooms online, as well as one of the most extensive casinos. Bet365 also offers bingo, financials and games to wager on. They truly are the most extensive gambling platform on the internet. Visit Bet365 to see just how much they offer. Bet365 offers a wide range of deposit options. Certain deposit options listed will only work in specific countries. Visit Bet365.com and check out the ‘deposit’ page to find out which deposit methods work for your country. You can withdraw via the majority of the deposit methods. Once again, some of these withdrawal methods only work in specific countries. 24 hour phone support, email, live help, post mail and an extensive FAQ.